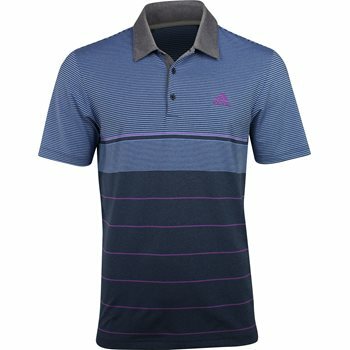 The Adidas Ultimate Heather Gradient Stripe golf polo combines athletic style with ultimate performance. The polo is made of soft polyester with built-in four-way stretch, offering full range of motion; a comfortable fit; and resistance to shrinking and wrinkles. The reinforced seams provide durability for everyday play and machine washing. Additional benefits include UV protection against harmful sunrays and moisture wicking for dry skin when sweating occurs.